Melee for long was the dominant combat style in the land of RuneScape, however with the release of the Evolution of Combat in November 2012 and the subsequent combat triangle rebalancing, melee is only on par with the other combat styles. Still, when used effectively it can unleash wrath upon your opponent. Learn how to train your melee stats here. Note: You can completely skip this step by completing the Waterfall Quest, which automatically gets your strength and attack to level 30. The Waterfall Quest can be difficult at low levels, be warned! When you are just beginning, you should focus on using two handed swords. Your other option is the dual wielding weapons, which are generally going to be more expensive and harder to obtain. Two handed swords can be bought either from the Grand Exchange in Northwest Varrock or bought from Gaius in northeast Burthorpe. At level 1 you should use bronze, at level 10 you should use iron, at level 20 you should use steel, and at level 30 you can move onto mithril. At this level armor is not very important because you will be fighting opponents that do not damage you very much. By far the fastest way of training melee (or any combat style) until level 30 is the abandoned mine, commonly referred to as the Troll Invasion dungeon located in northwest Burthorpe. You will receive 30 experience (and around 10 constitution experience) per kill and the trolls only have 50 lifepoints, making most of your kills one hit kills. You should probably start with the Troll Chuckers in the northern room as they are weak to melee. However as you progress you probably will be able to move onto other areas. It is advised that you eventually check out the western Troll Brute room as these trolls drop melee equipment and armor you can use. If you are focused and the dungeon is not too crowded, you can get to level in both stats in around an hour and a half (this is averaging an easy 10 kills per minute). If you are getting bored of killing trolls, you can always switch to the Lumbridge Goblins. They are similar to trolls in that they are high in density in this area and should be killed fairly easily. The issue with the goblins is that they are twice the lifepoints as the Burthorpe trolls (100 lifepoints) but are 5 experience less per kill (at 25 experience per kill). Therefore this method is not the fastest, but it is an alternative. Are you in the mood for mass murdering men? If so, you should contact a psychologist. While you are waiting for an appointment, you can train combat in the Edgeville men building. These Men are 150 life points but only give 25.5 experience per kill. Again, it is suggested that you stick to the Troll Invasion dungeon, but this is a possible alternative. At this point, you should upgrade to a mithril two handed sword. While you're at it, you might as well get an adamant two handed sword as you should be using this in ten levels. Again, two handed swords can be bought from the Grand Exchange in northwest Varrock or from Gaius in northeast Burthorpe. Armour is not necessary, but could prevent you from using food in certain circumstances. Mithril armour should suffice for anything in this level range. At this point in time, you are already an established melee fighter and can think about doing slayer tasks. This is restricted to members. Training slayer at this level is not particularly fast slayer or melee experience but it can be a nice break from your normal grind. A good place to train melee at this stage is the Edgeville Dungeon Hill Giants. There are 12 Hill Giants here, and an additional 11 Hill Giants in the level 20 Dungeoneering Resource Dungeon in the area. Although not superb experience, these have a 100% drop of big bones, which can be sold on the Grand Exchange for a fair price. Banking the bones will cut into your hourly experience gain. You could also bury the bones. If you are serious about banking bones, you should buy a brass key from the Grand Exchange and use it to enter a house west of Varrock (seen above in map). Climb down the ladder inside and you should find yourself among Hill Giants. If you're getting bored of Hill Giants, you could try Moss Giants, which are slightly better experience but less money/prayer experience. The main problem with these are that it is difficult to find an area where you can find these in mass. Freeplayers can check out Crandor Isle or the Varrock Sewers (both of these places are not great). Members can check out the Chaos Tunnels, which has one room with plenty of Moss Giants. In the fourth floor of the Stronghold of Security you can kill Ankou. Ankou are not the best experience at this level, but have fairly good drops which do not require banking (such as noted yew logs). The best place to kill Ankou is in the northwestern most room, seen above. If you are bored of Ankou, you could try killing other monsters on the fourth floor (similar experience but no drops) or you could try Flesh Crawlers on the second floor (poor drops). The fastest experience at this level are the Cave Crawlers, found in the first room of the Fremennik Slayer Dungeon (location seen above). There are several drawbacks to these guys: they are members only and they require level 10 slayer to kill. If you really do not want to do a slayer assignment, you can completed the Wanted! quest which involves no slayer but will automatically get you to 20 Slayer. Cave Crawlers also poison, but the damage is negligible. The level 74 Cave Crawlers are the best to kill. These give around 200 experience in either Attack/Strength per kill. There are also level 53 Cave Crawlers, which only give around half of the experience of their level 74 counterparts. There are four level 74 Cave Crawlers in the room; if you are out of level 74 Cave Crawlers to kill, kill a level 53 Cave Crawler to pass the time. Now you should either get a rune two handed sword or get some sort of rune dual wielded weapons, such as dual daggers, maces, or scimitars. When it comes to EOC training, dual wielded weapons are better for fighting one on one and two handed weapons are better for fighting monsters that are in a mass (due to area of effect abilities that strike multiple opponents). Dual wielding is members-only. If you haven't already, you should get some armour. Mithril will do, but adamant or even rune armour certainly is an improvement. Now you should seriously consider training most of your melee through slayer. At this point slayer and melee experience gained gets much better. Don't know how to efficiently slay? Check out our Slayer help guide. A popular place to train melee at this level is at the Earth Warriors. Located in the wilderness part of the Edgeville Dungeon (members only), these give around 200 experience per kill and are aggressive, allowing you to AFK train with ease. The downside of course with these is that they are located in the wilderness. Even with this you should be fairly safe, but be warned that low level PKers do come here from time to time. Deadly Red Spiders can be found at the end of the Varrock Sewers. They give close to 400 experience per kill. They are not aggressive so you cannot AFK, but they are outside of the wilderness. You can also find the Deadly Red Spiders below the Earth Warriors listed above. This area can be used for long after level 50 or 60 and will be mentioned later. If you are freeplay, you may find yourself here in perpetuity as options beyond here are limited. Proper equipment here would be either a two handed dragon weapon (such as the two handed sword or the much cheaper spear) or dual dragon weapons (dual dragon daggers are a popular choice). Armor is more necessary here. Rune should suffice. You can also look into the Rockshell armour, which increases your offensive bonus. Fire Giants are a good NPC to kill at this level. They drop big bones which can be buried and are fair droppers of charms. They can be killed in many places, such as the Waterfall Dungeon (seen above), Brimhaven Dungeon, or the Chaos Tunnels. Fire Giants are slightly more experience than Deadly Red Spiders. After starting the Defender of Varrock quest, you can kill Armoured Zombies, which give 473 experience per kill. To get to the Armoured Zombies, speak to Hartwin on the 2nd floor of Varrock Castle The area is multi-combat and multiple zombies will attack at once, so make sure you take advantage of Area of Effect abilities. If you wish, you can continue with the Deadly Red Spiders (a gear upgrade however is suggested). Level 70 is a bit of a hole when it comes to weaponry. You can use the barrows weaponry, however this degrades and costs money to repair. You can use an abyssal whip, but there is no suitable offhand weapon along with this (you would likely have to use an offhand draogn weapon). If you have completed the Branches of Darkmeyer you can use the Blisterwood Polearm, however not many people at this stage have the requirements for this quest. Level 75 opens up more options with the God Wars Dungeon weapons. You can use Saradomin's Sword, Zamorakian's Spear, or any of the four Godswords. It is not suggested that you buy a Zamorakian spear as this is fairly expensive due to it's use for fighting the corporeal beast, something you probably won't be doing too soon. You can either stick to rune/rocksheel armour or upgrade to Barrows or Bandos armour. This is not necessary at this point, but it can be useful. Bandos armour is considered power armour and gives boost to DPS. It is however expensive and may be out of your price range. Need some disposable cash? Then you should check out Green or preferably Blue Dragons. These are fast experience, but picking up the drops will slow your experience gain down. If you have 70 agility, it is suggested to kill Blue Dragons because you can use the shortcut to access them quickly in the Taverley Dungeon and bank easily. If you do not have 70 agility, you should either look at the Blue Dragon area south Yanille or Wilderness Green Dragons. Oddly enough, you should not use a dragonfire shield when dealing with normal dragons. This will slow down your kill rate a significant amount. Instead, you should bring a two handed weapon or dual wield and use the protect from magic prayer. The prayer will soak up most damage and you should be fine. Make sure you have a way to easily restore your prayer, like a teleport to a house or prayer potions. At this point in time you can AFK (play without paying full attention to the screen) hellhounds, a commonly used method of training. You'll need a full set of Guthan's barrow armour, and possibly a bonecrusher and a Dungeoneering necklace that automatically buries bones. If you don't have the latter you should bring food or a bunyip. Now head to the Taverley Dungeon and head towards the hellhound area (seen above). If you can't use the level 70/80 agility shortcut you will need a rusty key to access the area. Now position yourself in a spot where you can easily be attacked by the Hellhounds. If you have level 55 Dungeoneering, you can use the nearby Resource Dungeon which is a slightly better spot and less crowded. If you have the bonecrusher and prayer restoring necklace, you should put on protect from melee. If not, just let Guthans and the bunyip heal you. It is suggested you use the dungeoneering items over a bunyip as you will be allowed to use DPS boosting prayers such as piety, increasing your experience rate by around 7%. At level 75 attack you can substitute the Guthan's set for a Saradomin Godsword that has a passive ability (use a normal Saradomin Godsword on the Saradomin Altar in the God Wars Dungeon). Using full Bandos and a godsword can get you around 200k experience per hour. It is almost entirely AFK; you need to click at least once every five minutes to avoid logging out and will have to run out of the area to get the Hellhounds aggressive again. However, Hellhounds do not have good drops and you will not make any money from doing this. Chaotics, requiring 200,000 dungoneering tokens and 80 dungeoneering, are the level 80 weapons. Chaotic weapons degrade and cost money and possibly tokens to repair. What Chaotic should you buy? At this point, you should look into dual wielding weapons as they are more damage per second (DPS) than two handed weapons, unless you are in a mob setting (like AFKing Hellhounds). The problem with dual wielded chaotics is that they cost more tokens than two handed chaotics (200k tokens for the main hand and 100k tokens for the off hand, as opposed to 200k tokens for the two handed weapon). The exception to this rule are the chaotic claws. Chaotic claws cost 10 chaotic spikes (for a total of 200k tokens) and a pair of dragon claws. Chaotic claws also come fully charged as opposed to other chaotics which come with only 20% charge. For this reason, chaotic claws may be the best choice for you. If you do not like Dungeoneering or don't want to repair your items, you should stick to your level 75 weapon. On the armour side, you should look into buying a set of Bandos power armour if you haven't already, as this can increase your DPS by around 4%. A good source of money and decent training. These dragons have noticeable and are weak to stab, so if you find yourself not hitting consistently you can switch to a stab weapon (such as chaotic rapiers). Bringing a beast of burden familiar (war tortoise or above is suggested) will lengthen your trips and increase your experience. Again, if you do not have the level for super antifire potions you should still use dual wield or two handed weapons. Using the protect from magic prayer will negate the majority of damage from antifire. Watch out for the blue orb special attack, which will reflect all damage to you. The experience rate here is around 220k/hr. Along with being the fastest slayer experience in the game, abyssal demons are great melee experience. They can be effective training even at level 70, although you still need 85 slayer. Abyssal demons can be fought in the Slayer Tower, Kuradel's dungeon (must be on a task) and the abyssal space. Check out our Fight Cauldron Guide for full details. After the Brink of Extinction quest, you can access the Fight Cauldron. This will net you around 320k melee experience per hour, with the chance of obtaining uncut onyxes and obsidian armour. It is not completely AFKable as you will have to avoid lava plates to survive, however you will find it will not require your full attention. It is also a safe area. Jadinko males are among the fastest melee XP in the game. They do require 91 slayer, which can be an issue for some people, and are often considered boring to kill. They do however have a good chance of dropping an elite clue scroll. Although they are weak to range and strong against melee, waterfiends' defense can be overpowered with good gear. The most common place to kill these is the ancient cavern, which requires you to complete the Barbarian Training miniquest. Waterfiends are great crimson charm droppers, so this method should help out your summoning level. They can also be found in the chaos tunnels, where they are aggressive, allowing you to AFK them if you wish. The chaos tunnels are multi-combat, so beware! If you are finding accuracy issues, you may have to wait until you attain drygore/noxious weapons before continuing. At this point, you can wield level 90 melee weapons. These weapons, while being the cheapest of the level 90 weapons, are expensive and may not be in everyone's price range. Despite their cost they are immensely powerful and it is suggested you put these weapons on your shopping list sooner or later. For armour, you may either buy tier 80 torva armour or tier 85 tetsu armour. It is preferred that you get torva armour as the armour will provide a damage boost to your attacks. Tetsu armour is better for end game PvM, such as Vorago, but most people will not be training on Vorago to max their melee stats. If you cannot obtain either the suggested armours or weapons then you may have to continue using the methods mentioned in the 80-90/99 section. These methods are not necessarily slower than the methods below but will not yield as much money. Airut require 92 slayer and have tough defense. They can be found in the Piscatoris hunting area or Kuradel's Slayer dungeon (must be on task). It is suggested you kill these using drygore or noxious weapons. Airut have a 100% drop of airut bones, which are always high in demand for their prayer experience. They have a special attack, which will lead them to fire off a quick burst of punches. This can be prevented/delayed by using the "flurry" ability. The Bandos, Zamorak, and Saradomin generals can all be fought with melee, allowing you to train with XP rates usually between 300k-400k and also get around 3-4 million gold an hour. This is if done on a fast spawn instance, where the respawn rates are higher than normal, allowing for constant combat and no waiting around. This requires high end gear and likely some practice as well. The boss most frequently fought for melee training is General Graador. Although not necessary, these tools can help boost your experience rates. When drank, Attack and Strength potions will boost your damage output. If you are a low/medium herblore level, you have three choices: attack/strength potions, combat potions, and super attack/strength potions. Regular attack/strength potions boost your level by 8% of your attack/strength level +1. These are the only potions freeplayers can use. Combat potions do the same but are much cheaper and only take up one inventory slot (it is suggested to use combat potions if you don't have any attack/strength potions lying around). Super potions boost your levels by 2+12% of your attack/strength level. You should sip your potion again once it has dipped down a few levels. At very high levels of herblore you can create (untradeable) extreme potions, which boost your damage by 3+15% of your stat level. If you happen to have 88 herblore, you can create extreme attack potions. At level 89, you can create extreme strength potions. These are expensive to make but great for training. You should sip another dose of the extreme potions after your boosted stats have dipped down five levels. At 96 Herblore, you can create Overload potions. These are the best potions for any type of combat training because they have the effect of all extreme potions and refresh your stats every 15 seconds. Overloads require making all extreme potions and a torstol, making overloads expensive. You may also use combination potions after the completion of Plague's End, but this is not necessary. There are several offensive prayers you can use. The highest level single stat prayers (ultimate strength and incredible reflexes) boost your attack/strength by 5%. If you are wearing an Amulet of Zealots (a reward from Dungeoneering) you can boost this an additional 10%. This is the highest possible boost from prayer. This is also freeplay, but the Amulet of Zealots has a -5 Prayer bonus, so your prayer will drain very quickly. If you have completed the Knight Waves you can unlock Chivalry, which requires 60 Prayer to use. Chivarly increases your attack, strength, and defense by 6%. The next Knights Wave prayer is Piety, which boosts attack, strength, and defense by 7%. At level 95 and after the completion of Temple at Senntisten, you can use the Turmoil curse. This boosts attack, strength, and defense by 10% and reduces your enemy's attack, strength, and defense as well (reduction of the enemy's stats are only noticeable on monsters that take awhile to kill, such as Nex or the Kalphite King). Using the Soulsplit curse at 92 Prayer can also allow you to save food and prevent too many bank trips. Several summoning familiars will give you melee experience when they fight in combat. This includes the minotaurs and the Iron Titan. Scrimshaws are items made from Player Owned Ports. Regular versions can be bought from other players but the superior versions of the scrimshaws can only be created by the player his/herself. The regular/superior Attack Scrimshaw improves accuracy by 2/4%. Despite the bonus, it's only worth using in situations where your accuracy is between 30-70% (you won't need it for most training methods). The Vampyrism scrimshaw is generally more useful, allowing you to stay longer during high damage activities without banking. Auras can be bought with loyalty points from Xuan in Varrock/Burthorpe or Dilwyn in Prifddinas. Although they do not directly affect melee experience gained, Vampyrism and Penance are going to be the best auras to use in combat, generally speaking. There are not many great auras for melee sadly; auras such as the Beserker aura are rarely used due to their minimal effect. A common question that comes up during training is what combat mode you should be using. It's a matter of personal choice, but it's important to note that among all combat styles EOC is 10-15% more DPS (damage per second) than Legacy. However, if you find EOC uncomfortable to use, you may use Legacy as a viable substitute. If you choose to use EOC, you're going to need a good ability bar setup. While you should play around with this yourself, here's a good start for both dual wielding and 2h weapons. Your basic ability rotation will depend on your weapon(s) - if you have 2h or Dual Wield. Universal basic abilities include Slice, Sever, Dismember, Punish, and Backhand / Kick. Dual Wield basic abilities include Decimate and Havoc, and 2h basic abilities include Cleave and Smash. However, your thresholds will do the majority of the damage. Use Assault whenever it is off cool down, and also use Slaughter and take one step forward to inflict an incredible bleed. If Dual Wielding, Destroy is another very powerful ability and Flurry can be useful in AOE situations and against certain monsters (Airut and GWD). For 2h users you may also use Hurricane and Quake, both of which are AOE abilities. If you intend on using Revolution, putting powerful basic abilities over weaker ones is suggested as you will use the powerful basics more often. Food, potions, and possible healing abilities can also be useful for max XP and sustainability. The Freedom ability shouldn't used much in combat training but it can save your life if you find yourself stunned against a tough opponent, and therefore putting it on any ability bar is a good idea. Again, we suggest you experiment with your own setup and hotkeys (instead of the default 1-2-3-4-5-6... etc.). If you are a freeplayer, you should be fine with this guide until the higher levels (which are all members monsters). 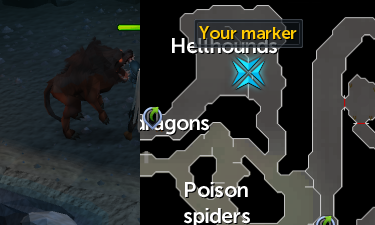 With high level freeplay you have two choices: Deadly Red Spiders in the Varrock Sewers or Hellhounds in the Bounty Hunter Volcano in the wilderness. Deadly Red Spiders are very good experience but require full attention. Hellhounds in the wilderness can be semi-AFKed (they are aggressive) but you may be PKed from time to time. If you are serious about training your melee stats, you've probably checked numerous guides through various mediums. We don't discourage you from doing this, but at the same time we thought we should warn that many times experience per hour values get massively inflated in training guides, particularly combat training guides. Realize that it may be impossible to achieve the highest possible combat experience/hr for every training method on every guide. The Mighty Fall A 50,000 XP and 75,000 XP combat lamp. Contact! A lamp giving you two wishes, each of which provide you with 7,000 experience to any combat skill other than Prayer.